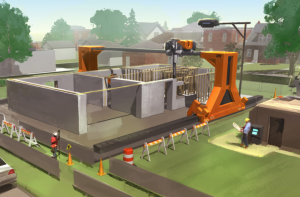 How Can 3D Printing Be Applied in Construction Today? 3-D printing is everywhere. Well, almost. While media stories, industry updates, and even an episode of the hit scripted television show The Good Wife make it seem that everyone and their friends are 3-D printing, that's not quite the case. 3-D printing is not a brand new break through, to be sure. The technology to print has existed for the better part of a decade. But until a patent expired about five years ago, access and use of the equipment was limited. And while the practice of making 3-D printing part of construction technology is picking up steam in Europe and Asia, it's not being much used in the United States. Why not? At the moment, Computer Assisted Design (CAD) and Building Information Modeling (BIM) software being used in The United States is not compatible with 3-D printer systems. However, American tech companies are working to integrate them, meaning that U.S. project engineers could soon be whipping up homes in less than a day, like colleagues in China and Italy. But should they? As 3D printing in the construction industry inches towards mainstream use, problems and controversy are growing, too. They range from the quality and durability of the produced goods, to potential lawsuits. Who's legally responsible when 3-D printing goes awry? The printer operator? The printer manufacturer? Or the designer of the instructions that are programmed into the printer? And a construction project manager has even more to contemplate when considering using a 3-D printer. Some of its supposed benefits in construction use (less waste, more integration of recycled materials) have not borne out. A review of a 3-D printed house in Amsterdam revealed that contrary to the manufacturer’s claims, the 3D print technology used huge amounts of energy, produced significant pollution, and wasn't able to use recycled plastics. Researchers think that many of these problems can be resolved by using different types of building materials, and are conducting studies now. So, should a project superintendent clear room on a site to use a 3-D printer now, or wait until kinks are gotten out of this technology? Even the designers and engineers who are most excited about the applications of construction 3D printing admit that with the current technology, entire structures built with it would be neither cheap nor environmentally sustainable. But that doesn't mean that 3-D printing has no applications in current construction at a smaller level. The Chinese construction firm Win-Sun is already mass 3-D printing various components to be added to traditionally constructed houses. And an architecture professor at UC Berkley is producing modular architectural elements (such as porous walls) with 3-D printers. These components are produced using less energy, and their rapid completion means that they're available more quickly for use in building emergency housing. So while "printing" an entire house may not be feasible for the foreseeable future, the technology certainly has practical applications on a smaller scale in terms of parts and components and shouldn't be discounted.